Morten is a Danish Copenhagen-based 39 year-old uw-photographer, who works as a bricklayer. Diving came by chance to Morten, who had never really considered getting a certificate. However, on a travel in 2002 his girlfriend convinced him to take the course on Phi Phi Islands in Thailand, and a new world opened up to him. The year after Morten upgraded to a bigger DSLR camera system in pursuit of better photo quality. Morten has participated in three workshops with the famous English uw-photographer, Alex Mustard, to improve his skills and to meet other likeminded. Since 2010 Morten has worked as a freelance photographer and writer for the Scandinavian dive magazines DYK , Sportsdykkeren and Dykking. It has taken Morten to the Philippines, Lanzarote, Sardinia, Norway, and Corsica. Mortens articles and photos have also been published in DIVER (UK), SCUBA (UK) Sportsdykaren (Sweden), Scubalife (Croatia) and Unterwasser (Germany). Mortens wife is a former Danish national team freediver and therefore Morten was invited to be the official underwater photographer at the World Championships in freediving in 2009. In 2011 & 2012 Morten assisted the Danish Nikon ambassador Casper Tybjerg during expeditions to the Red Sea. Morten and Casper had 20 participants with them, who Casper helped out with land photography and Morten assisted them with their first try at underwater photography. And the end of the expeditions all the best photos from the trip were given to HEPCA (Hurghada Environmental Protection and Conservation Association) in their ongoing battle for protecting the life in and around the Red Sea. It was very rewarding for Morten and all the participants to be able to give these photos to HEPCA knowing that they will be put to good use keeping the Red Sea healthy! 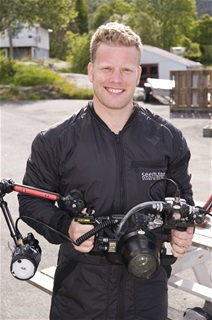 In 2010 Morten won the bronze medal in the Danish national underwater championship. In 2013 he won the macro category at the Copenhagen international dive shows underwater photography contest. And in February 2015 Morten won the 3rd place in the wide angle category in UPY - Under Water Photographer of the year. UPY received 2500 entries from under water photographers from 40 countries all over the world and Morten was in London to have his photo presented on stage at London International Dive Show.